CC: So I guess just to start: what are you, a crazy person? JF: Ummmmmm, no? (laughs) I like to think that everyone else is crazy. Everyone kinda has a stigma that it’s this really mean thing to do, which I don’t think is true. CC: Do you want to explain what “it” is before we continue? CC: I guess from my point of view, it’s not like a “mean” thing to use the function: I just don’t want other people to know; I want to have the freedom to do whatever I want. JF: I guess I’m the kind of person that doesn’t have any secrets to hide. In fact, when I had it OFF it was weird for people. They were just like, “Sooooo are you getting my messages?” That’s exactly why I have it on. I don’t want there to be a mystery of “Did this person read it?” because I hate it when people do it to me. CC: Has it ever caused a problem? JF: In my dating life! Apparently [there’s reason for secrecy if your date is] like, “Oh you’re just reading my message?” It can be interpreted as a shady thing when I just read their message but haven’t answered, and it’s like “Okay, you’re CHOOSING to ignore me,” which I totally get but it’s never really that I ignore people… I just forget to reply, or I don’t have the time to. CC: Okay, so what happened? You turned it off for a week? JF: I turned it off for a week, and every ten minutes people thought I was dead. This one time I was out with my friends, and my roommate/best friend, Kalyn, started texting me over and over and over, “Are you alive? Are you alive? Are you alive?” She’s not used to me replying [immediately,] but she’s used to her messages being delivered and “read”. It didn’t look like I was reading them, so she thought I was actually dead. A lot of people apparently keep tabs on me that way! CC: How did you feel having it off? JF: It was very strange. As I think it would be very strange for all of you having it on. But for me, it added a sense of mystery that almost translated into a sense of mistrust that I’m NOT reading people’s messages and THAT made people uncomfortable. Everyone around me was like “Well this is kinda new.” Some people just thought I wasn’t opening their messages. CC: Ideally for you, would everyone have “read receipts” on? CC: You want other people to do it? acknowledged each other rather than having that moment of like “Did they get this message yet?” “Did this person read this message yet?” because that just creates a culture of mystery and distrust and that’s weird. CC: Can you identify any sort of trend between the type of people who have it on and don’t? CC: Is there anything that YOU would like to talk about in all this that I didn’t touch on? JF: I would recommend for everyone to turn it on, even for a few days, and see what happens. It might change your life, it might not, but at the end of the day it will be something new. To have something new like that, to see the other side of the spectrum, will be EYE OPENING. On Joseph’s advice, our team here at The Cogswell Chronicle decided to do just that. Members who opted into our experiment were instructed to switch their read receipts “on” for one week, recording any ups and downs along the way. The whole experience could be described in a word: ANXIETY. Hannah Gonzalez, who first pitched the experiment, expressed deep and immediate regret - stating she wished she had never suggested it in the first place. Across the board, our team members reported a simultaneous increase in the urge to respond to texts right away, and a decrease in the urge to text at all so as to avoid the stress of the situation. Several participants reported interpersonal conflict arising out of forgetting to respond after having read messages, the crown jewel being a team member who accidentally left her manager on “read” after having opened a text containing a work question. Unsurprisingly, a tangible wave of relief spread across the room as the experiment ended. For all the turmoil it caused, the experiment did bring some positive changes along with it. 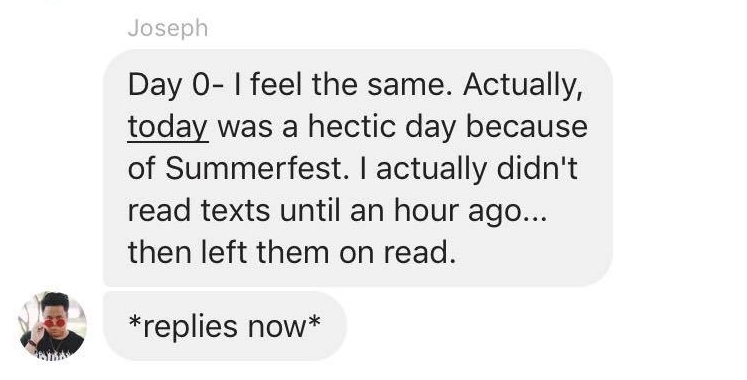 Kayln Farmer went so far as to make the full switch to #TeamReadReceipts, stating that even though it may hurt sometimes, she feels it can help her contacts keep better track of her. 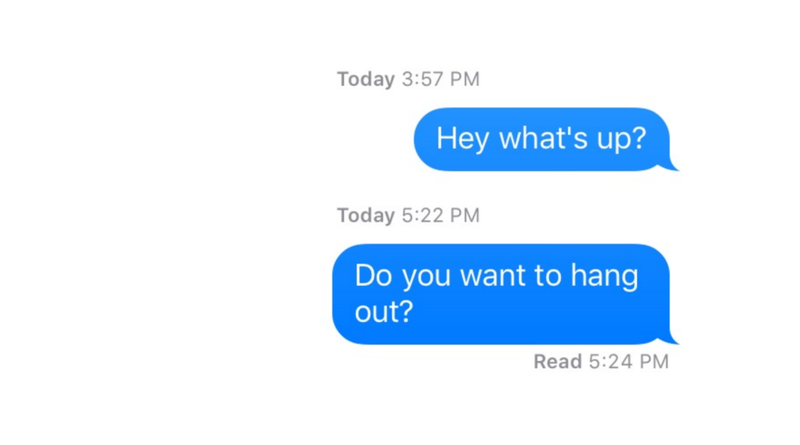 Read receipts push her to have more accountability when it comes to her texting habits. But even those on “#OhHeckNoTurnThatIshOff” became more aware and introspective of their texting habits, reflecting on why they do or don’t respond at times - and how it may be perceived.